Easter is in just a few weeks! I love this holiday so much. Easter is a very special and meaningful holiday filled with so much fun and excitement and delicious food. I mean, who doesn’t love walking around their backyard eating chocolate and twirling in a cute Easter dress?! 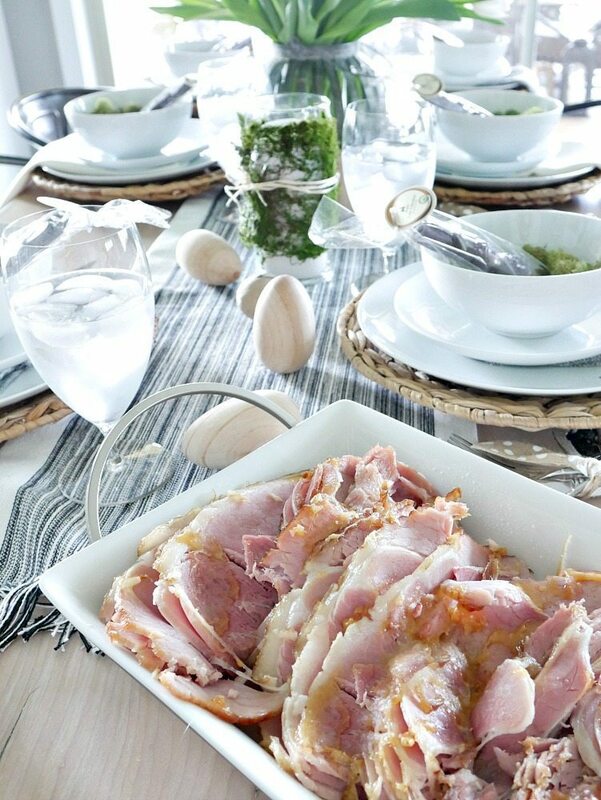 If you happen to be the one hosting Easter this year, I wanted to share a few Easy Easter Dinner Ideas. 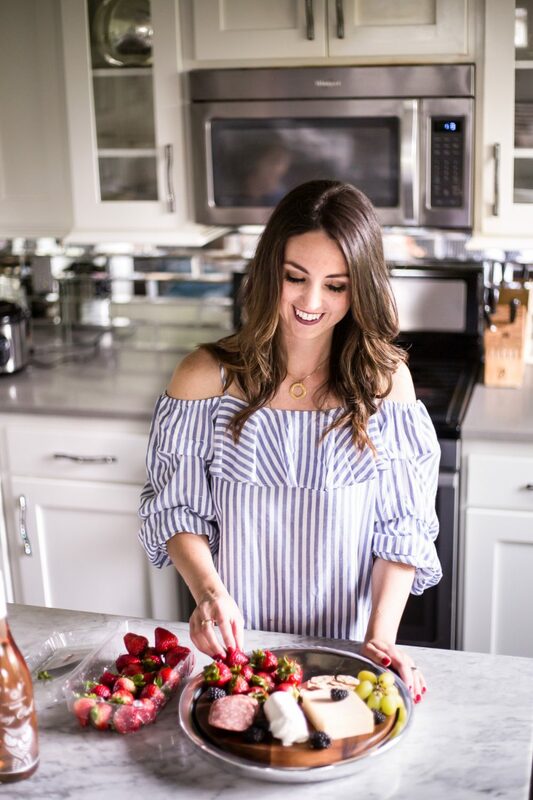 Hosting a big dinner can be stressful and you often spend most of the time in the kitchen doing meal prep and making sure everything is perfect. 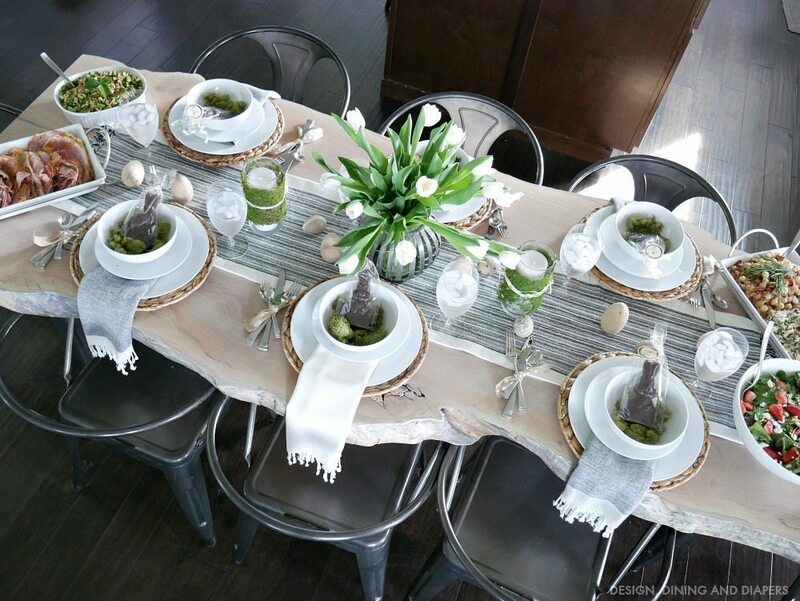 But here are a few ideas on how to keep things simple but also elegant and beautiful. ORDER YOUR FOOD ONLINE! 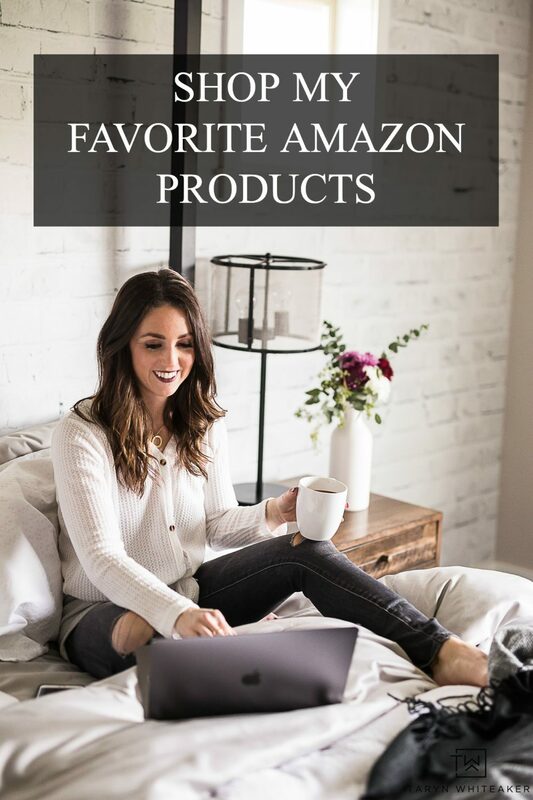 Over the past several years I have fallen in love with ordering my groceries online. After the family goes to bed, I sit down and do my meal prep, make of list of everything I need, then place my order online. Being able to do this at home with no kids distracting me makes SUCH a huge difference and ends up saving me a lot of time. And we all know how precious our time is. FLOWERS ARE A MUST! I am here to tell you that flowers make all the difference. They don’t have to be expensive or excessive, a few simple tulip bundles will do. They bring such a warmth to a space and make everything look pulled together. 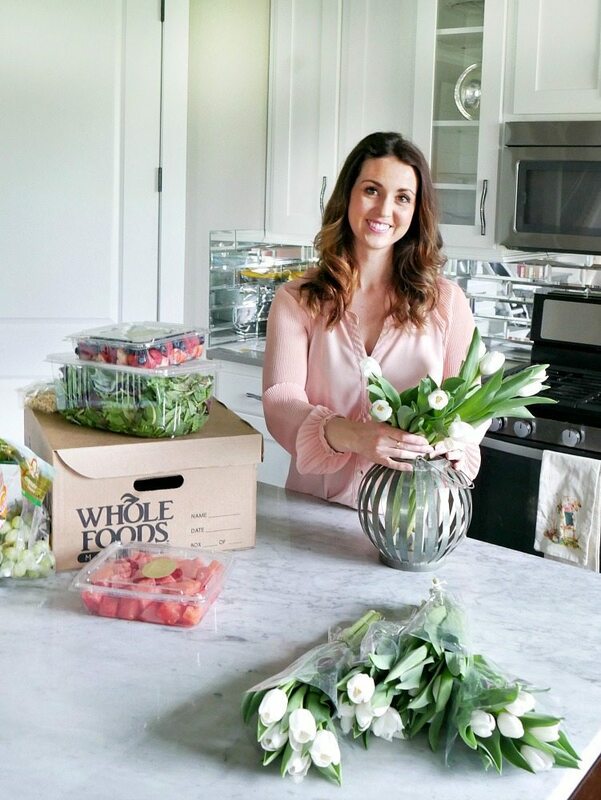 It can be as simple as grabbing a few bouquets at the grocery store when you pick up your food order. 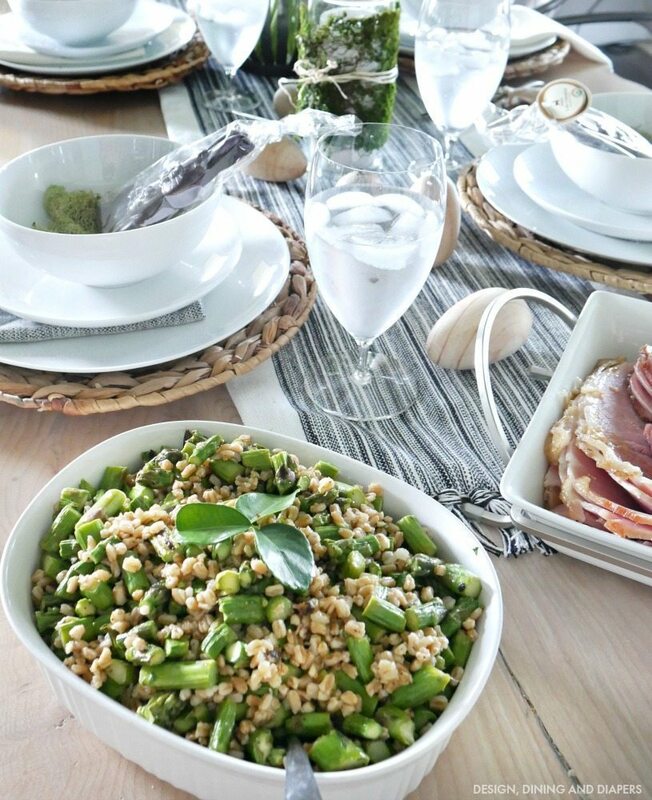 TIP: For Easter this year, Whole Foods Market has delicious ready-made entrees and sides to make hosting your Easter gathering even easier. You can select a full meal with sides or pick and choose what you would like. They even offer meals for those of us with dietary restrictions which is so awesome! My kids and I are all gluten-free and they have so many great options. Then, all you have to do is head to the store, pick up your box of goodies and grab a few extra items like beautiful flowers for the table and a few favors for your guests. 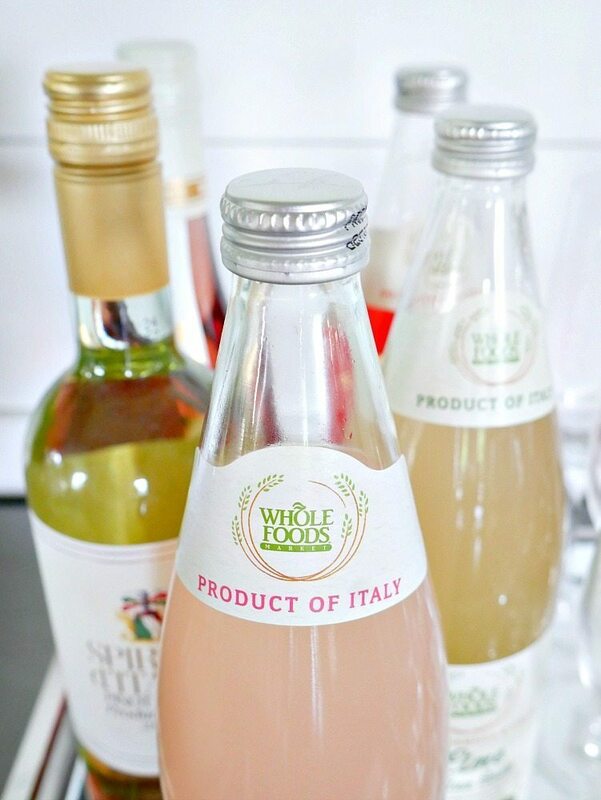 Check out Whole Foods Market Online Ordering for more details. 3. 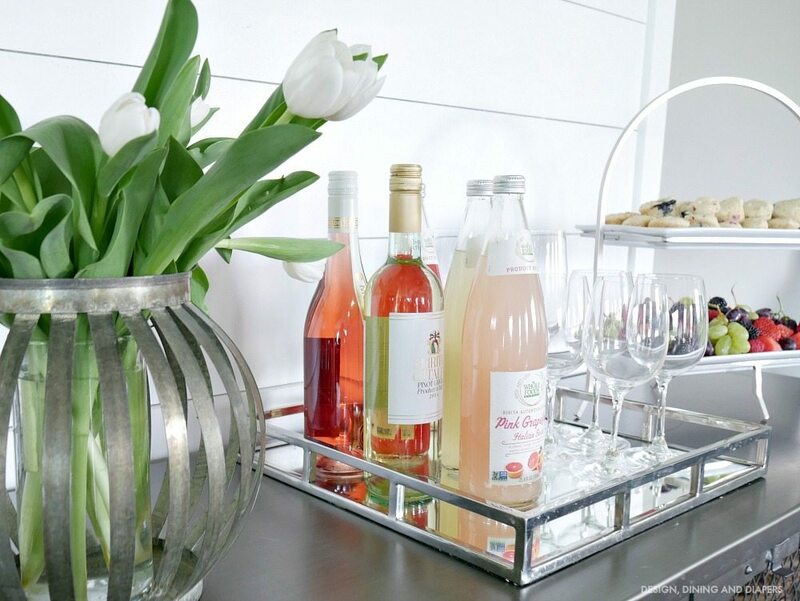 CREATE A DRINK AND APPETIZER STATION: It’s always nice to have a refreshing drink in hand and something to munch on as you wait for brunch or dinner to be ready. This little station doesn’t have to be anything overboard, simply place a few pretty bottles that will appeal to your guests and a few simple finger foods. I chose to set out a a bottle of Rose and Pinot Grigio and some Italian Soda for the kids and add a display of fresh homemade blueberries muffins and fresh fruit. 4. ADD A LITTLE GARNISH: Just because you are serving pre-made side dishes that you picked up at the store, doesn’t mean they have to look like it! These beautiful dishes came straight from the chefs at Whole Foods Market and all I did was carefully place them into my own serving dishes, heat them up and add my own garnishes. A little rosemary and lemon thyme make this food look so inviting and fresh out of the oven. 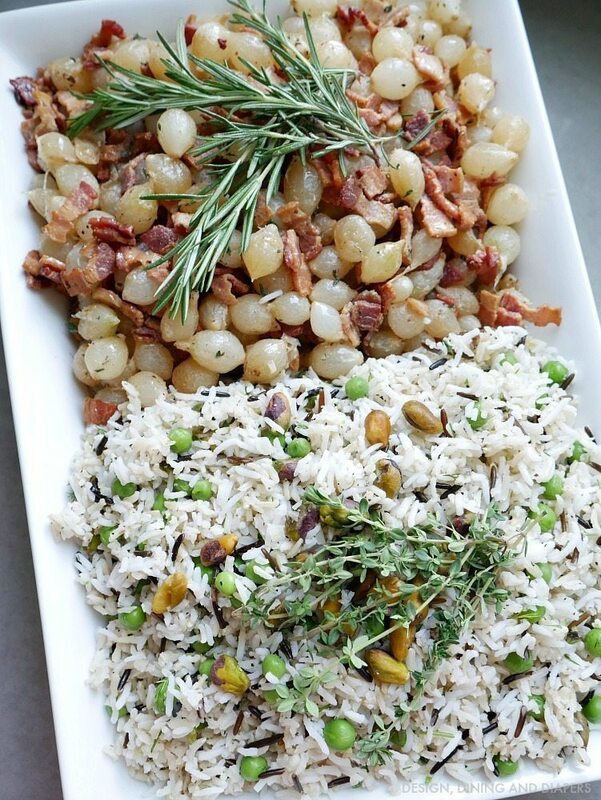 If you decide to place your Easter order with Whole Foods Market, this is the Bacon and Thyme Braised Onion side dish and the Wild & Basmati Rice with Peas and Pistachios. Both very flavorful and hefty portions! 5. SERVE FAMILY STYLE: I’m a big fan of having everyone sit down at the table and serving food family style. There is something about it that makes the gathering feel intimate. This will cut down on time prepping a buffet. 6. 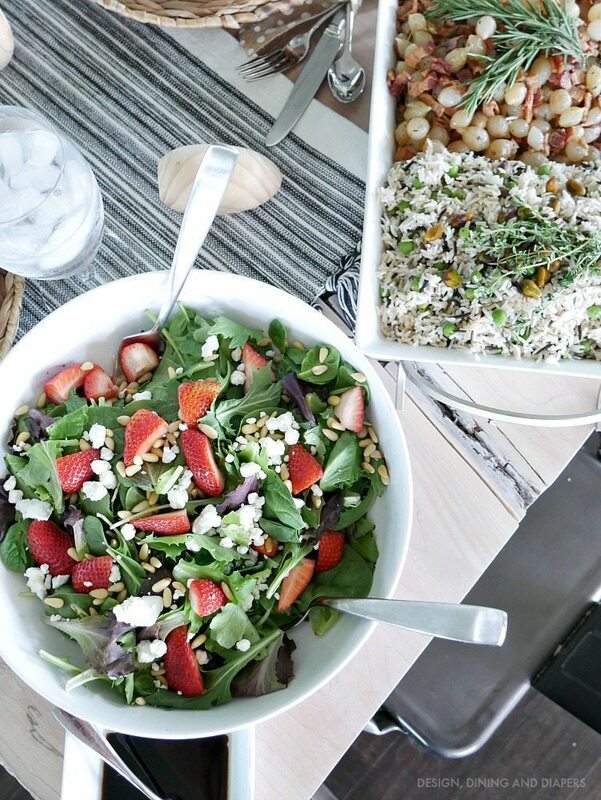 ADD AN EASY GREEN SALAD: While your pre-made meals are heating up in the oven, toss together an easy green salad (I’ll be sharing the recipe for this soon). This adds a little color to the table too. So let’s recap this, your meal is heating nicely in the oven, all you had to do was heat the oven up and put the dishes in and you just spent 5 minutes making a salad. See, this is easy! 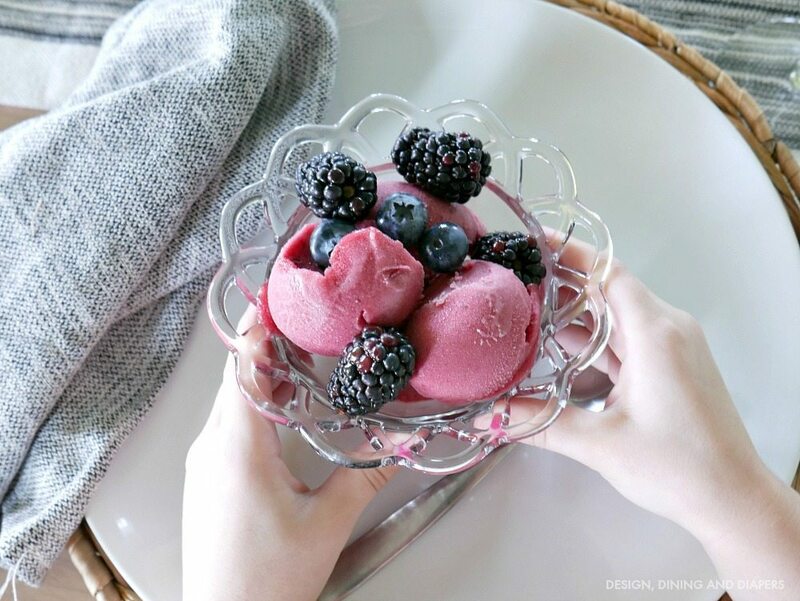 If you are up for something a little richer, Trending at Whole Foods Market: Berry Chantilly Cake is something to check out! 10. 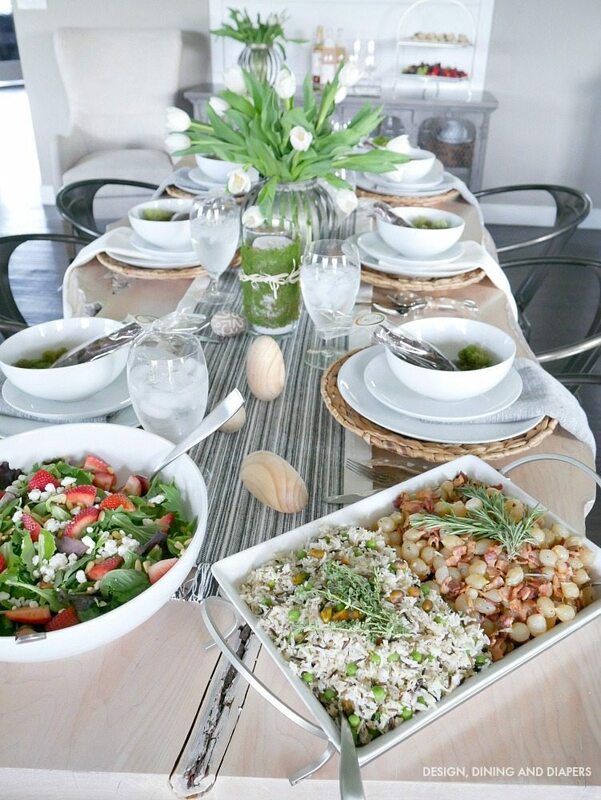 GIVE YOURSELF A HIGH FIVE: This is the part when you managed to put together a beautiful and delicious Easter dinner for your friends and family, stay stress-free, spend minimal time in the kitchen and ENJOY it! Happy Easter my friends!